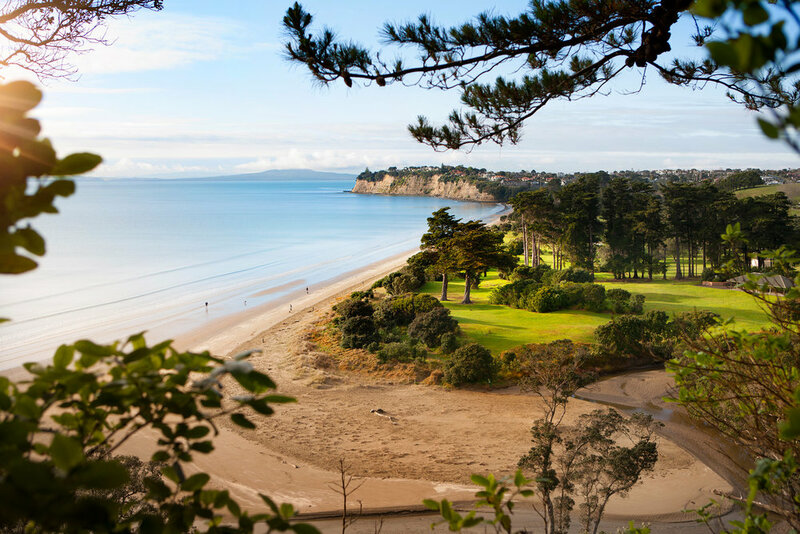 Auckland’s massive coastline is abundant in sand and sea; from small cosy nooks to wide, open spaces. Each beach or bay is unique in its nature and whatever you are looking for, you’ll find your gem in one of these spots. Here’s some of our favourites to help you find your perfect slice of heaven depending on what you feel like today! We’ll start with this one - the North Shore’s most prominent beach, known for its long stretch of golden sand touched by hundreds of feet each week. The general vibe is sporty! The boat ramp makes launching easy, so sailing, motorboating, and jet skiing, are popular from here. The beach hosts the Beach Series every Tuesday, an event offering races in swimming, beach/coastal running, and stand-up paddling. Many people walk their dogs here, march up and down the sand whilst catching up over coffee, and make the most of the unspoiled view of Rangitoto Island. The new precinct of bars and restaurants on the front has turned the beach into a buzzing melting pot of a meeting place. A few beaches north up the coastline is Browns Bay, also with a spectacular view of Rangitoto. Here you can visit Penguino, arguably the best gelato parlour on the shore. Browns Bay is quite sheltered, so ideal for swimming in calm water, and there’s a kid’s playground making it a great spot for families. From here you can easily walk to Rothesay Bay to the south, and adventure around on the rocks to the north to reach Waiake and the tor at Torbay, if you fancy a bit of coasteering – just keep your eye on the tides! Hopping over to the West Coast now, Piha is about a 45 minute drive from Auckland city centre and takes on a whole different vibe: surf. Piha is a renowned surf beach with infamous rips and tides that are notoriously changeable, making it a dangerous spot for many inexperienced swimmers/surfers – with lots of activity from Piha Surf Life Saving Club. However, the black sand and the huge waves draw visitors from all around, and even if you don’t want to venture into the water it’s a great place to have a picnic, venture up Lion Rock, and watch the pros on the waves. The sand is black here because it’s volcanic, which is iconic for the West Coast. Muriwai is just around the corner from Piha, and offers the same black sand and towering waves, but with a lot more space. It’s a long, straight beach (that goes for miles!) rather than the small cove of Piha. The water is a little safer (but still, be careful) and is popular for body boarding and body surfing. 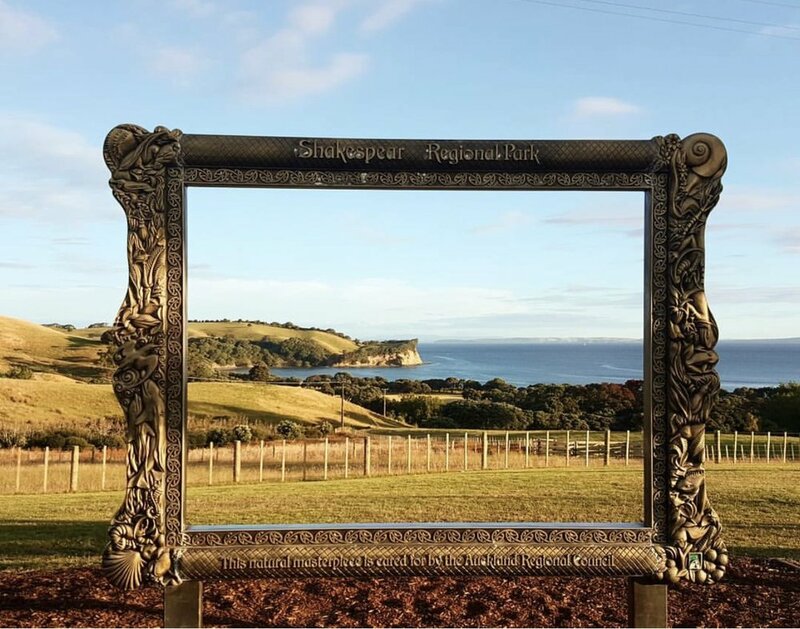 You can also walk to an Albatross Colony up on the cliff and look down on hundreds of huge nesting birds, as well as out across the Tasman Sea. Sunsets on the West Coast are pretty special too. Back over on the Pacific side, where the sand is white and the water blue, a top-notch spot to go is Tawharanui. As you approach the beach from the gravel car park, the sight itself is epic and you’ll think you’re standing in a postcard. There’s plenty to do: roam up and down, bake on the sand, find shelter under a Pohutukawa tree, swim, climb rocks, search rock pools, and spot dolphins. It’s picture perfect and the water can be good for surfing too, so check the forecast! Similar to Tawharanui, but much larger, Omaha is a local’s paradise. Beach houses or holiday baches are so popular here that there’s now a neighbourhood and community of people that flock here every summer. It’s a growing area with restaurants, bars, houses, and surf rentals. On a good day you can slice a wave or two, or lie on the beach and watch the summer day unfold around you as gleeful visitors come to the water. It’s great for swimming, building sandcastles, and meeting big groups because there’s so much space. 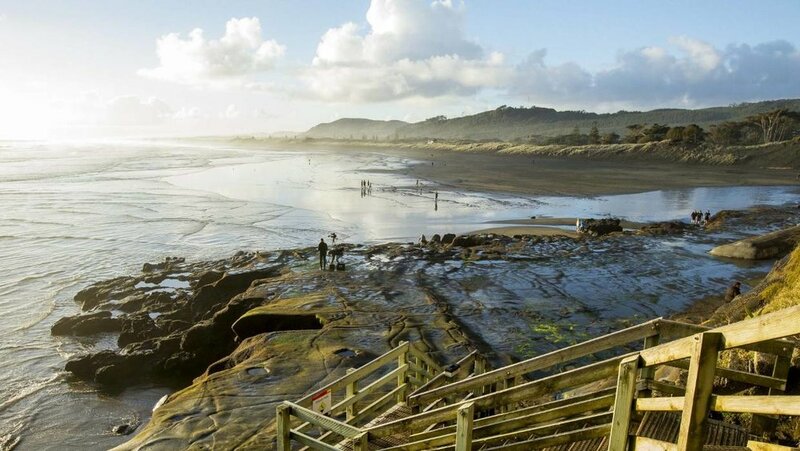 A bit further south lies Orewa; a quieter beach with a beach-side community. The water is flatter here, there’s no surf-able waves, but plenty of ice cream to be found and a good long stretch of sand if you fancy a power walk or a run. Stand-up paddling thrives here because of the calm water, and a farmers’ market nearby is a perfect attraction to combine with a visit to the salty sands. If you’re after a quiet afternoon reading in a beach chair, Orewa is the place for you. This beautiful park next to the beach is a quiet haven to escape to; you’re well secluded here. The grass lands are great for chucking a ball around, having a picnic, flying a kite, and spotting the occasional peacock that roams wild here. The estuary is a good place to launch kayaks from and even throw a fishing line in. Swimming is a chilled activity here and there’s even a campervan park and campsite if you fancy staying a few nights! The headland is a good place for a mini hike or a hilly run, too. 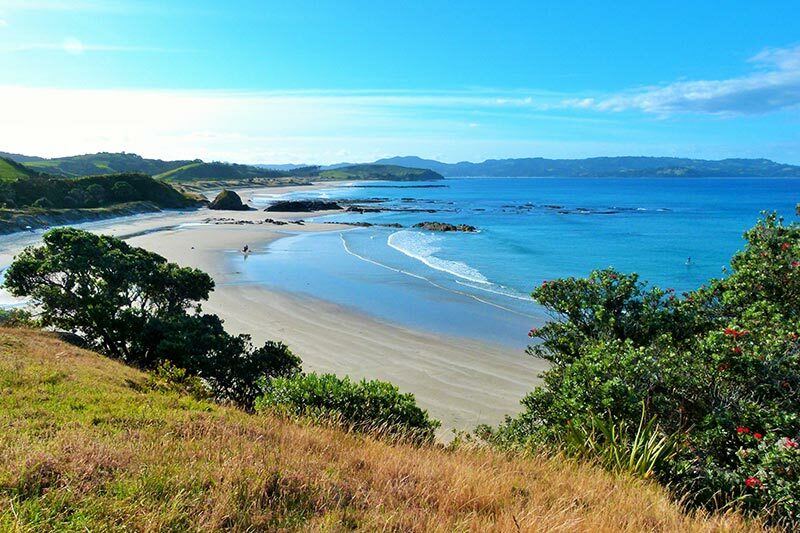 The ‘last’, most northern beach on the North Shore is Long Bay. A kilometre stretch of beach and grass and places to park makes it a great place for big groups to congregate and set up camp for the day. It is a sacred site, as pre-European bones were found there in recent years. The operating restaurant and kiosk closed out of respect to the burial ground, so if you’re heading there be sure to pack everything you need! Locals love to hang out there and meet for coastal walks. If you wander along the cliffs to the north, you’ll come across the quiet nudist beaches.